With Christmas and the winter solstice on its merry way already, it feels just about the right time to begin some posts themed around the happiest of all holidays! So this year, why not take a few nights out to relax, and spend six wonderful eves celebrating the joys of winter and the music it brings to us all? This year as we snuggle up by the fire and warm our very souls, let's take a look at the appropriately themed releases have delivered unto us all this 2015. For the beautiful winter that we all come to celebrate, let's show our joy through the beauty of song. Are you ready? When it comes to the winter time, I can't help but listen to a few classic Christmas songs alongside my J-pop tunes. I mean, can you blame me? Christmas songs are catchy, fun and all-around perfect mood-makers for the Yuletide season. 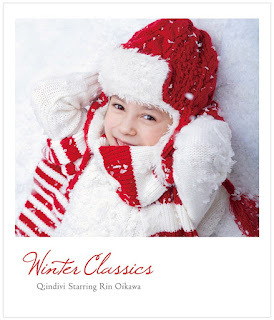 So, when I found out that Q;indivi had released their very own Winter Classics collection for the year of 2015, you can bet that I was so ready for it! I mean... it's Q;indivi, and they are singing Christmas songs!!! Can this winter get any better!? I love Q;indivi, that much is clear. I mean, I don't follow them with great dedication like I do HouPri, but when they release something new, y'all can be sure that I am on that bandwagon as soon as I realise new material has been released. This group is, of any non-Idol group out there on the J-pop scene, one of my favourites, as well as the only one that doesn't always sing in Japanese, but mostly, English. Their spin on Disney, Ghibli and classic children's songs are great, and I can't deny it, Rin Okinawa's breathy vocals are to die for! So yeah, Q;indivi is totally on my radar, and I do really like them for what they do. They remix and remake, creating some beautiful content that always has me singing along to it with a smile on my face. They are addictive, and I am a little to a lot hooked, so to speak. Anyway, enough guffawing over the wonder that is Q;indivi, because we are not here to gawp, but to instead review. So, with all of that out of the way, let's take a look at the splendor that is Q;indivi's latest release, Winter Classics. Are you ready to get into the spirit of winter, too? Q;indivi's latest album release, Winter Classics, contains exactly what it says on the case; a collection of wonderful winter melodies that we all know and love, give or take a few that we may have missed out on in our childhood. Remixed in Q;indivi's own unique fashion, paired with gorgeous earthy vocals courtesy of the amazing Rin Okinawa, one could expect this to be a pleasant experience for both the seasoned and new listeners of Q;indivi's works. I can say with sincerity that, yes, this is indeed a wonderful experience as a listener, no matter how many times I have happened to listen to the works of this amazing group. The album contains what I can only describe as magic inside of it. Beautiful twinkling sounds, whimsical melodies and a feeling of sweet nostalgia all come together to create a beautiful winter quality to the songs presented in this album. Like any winter melody you may here at this time of year, old, new or in the middle, you really feel that amazing winter feel to these songs, a quality that brings forth the ideas of Christmas, warmth, magic and happiness. Christmas Eve, My Baby Santa Clause and Have Yourself A Merry Little Christmas, to name a few, are certainly the kind of songs to deliver that precious Christmas-like feeling in their music, bringing to life the idea of winter and how magical it can be just by the sound of a nice jingle released at a certain time of the year. Of course, there are other songs present within this album that create less of a magical feeling, yet still deliver a warm and satisfying experience for the listener. Merry Christmas Mr. Lawrence, for instance, feels more modern than some other tunes present here, whilst Winter Song has a very soothing yet somewhat lonely feeling to its sound, despite how reassuring it feels in tone. To put it simply, though this album feels whimsical and merry with some songs, it also has a mix of mature and sentimental tones to give it balance, as well as to deliver to a wider audience. This is a really beautifully crafted album, one that has quickly become a staple Christmas listen for the year. It has a wonderful balance of fun, energetic sounds paired with some more mature tunes, all remixed to perfection with Rin Okinawa's gorgeous, breathy voice. It has also succeeded in introducing me to a few new winter songs that I hadn't even known existed before now, allowing for Winter Classics to feel fresh upon my first listen, giving me something new to look forward to as well as to find new favourites in songs such as My Baby Santa Clause, Winter Song and La primavera RV 269. To conclude, this is a wonderful album that captures the true beauty of winter and brings the magic of the season to life in its sound. It creates a wonderful image of the winter season, as well as providing the spirit and mood of Christmas or winter for the listener. It's upbeat but sentimental, bright as well as mature, and overall, it's the perfect balance of Christmas and winter songs that will appeal to most who give this album a chance. Due to being a sucker for not only Christmas songs, but also Q;indivi, I am going to be an overly generous soul and bestow this album release with a glorious five stars for its beauty! The variety of songs, sound of the tracks and the beauty of Rin Okinawa's voice all play perfectly here, creating this wonderful atmosphere that has really put me into the spirit of Christmas. Having listened to it, I really do feel that, now, the Christmas season has truly begun. To end this, do you all have a favourite classic winter song that you know and love from your childhood, or is there a song that is forever on your playlist that you endlessly loop during the winter season? Let me know if you wish to, and please, enjoy your classics and new releases with happiness and Christmas cheer! Until next time, I hope that you all stay safe and are happy, healthy and enjoying the holidays if you celebrate them, and if not, then please enjoy life and all it brings, and of course, please keep on loving Idols and J-pop! Love reading about this :D. Hope you have a great day ^^.